Assembly of the EPB and back up gantries took place at Doukisis Plakendias station. The concrete raft of the station equipped with a sliding path, consists of two steel plates, each to support the shield of the EPB. The steel plates placed in concrete parallel to the centre line of the station raft tunnel. Minimum tunnel excavation radius (correction curve) 250 m.
Shield overburden layer 9 m. – 17 m.
The propulsion of the EPB is electric-hydraulic and moves forward by pushing against the last prefabricated segmental tunnel concrete ring with the 28th shove rams. The Earth Pressure Balance (TBM) Shield is capable to operate in “open mode” (non-pressurized screw conveyor) and closed mode (pressurised screw conveyor). The TBM and Back Up System is divided into sections for transport and site assembly. The Shield components are designed to facilitate transportation, assembly and dismantling operations, including removal in-tunnel and abandonment of the body (skin) for ground support. All non – replaceable parts have a minimum design life of 10,000 operating hours. The working pressure is 3 bars and the outside diameter of the shield is 9440mm. The complete EPB length including the back up system is 90m. The TBM shield, designed to withstand all loads and forces occurring from the ground overburden, Earth and loads and forces arising from operating the TBM, both in normal mode and in modes required correcting misalignment of a radius of 250m. Deformations caused by any of these loads are limited to allow the undisturbed operation of the TBM. Seven numbers of inclined penetrations in shield sleeves fitted with shut off valves spaced around the periphery for angular ground investigation and treatment. The TBM shield consists of the front, the centre and the back shield. Cutter Head : The EPB cutter head structure and main bearing with its support system is rated to absorb the maximum forces envisaged in operation. The cutter head is a substantial structure, to provide the necessary mechanical support to the tunnel face. It incorporates the necessary abrasion protection features to enable the shield to complete the excavation of the tunnel through the various geological conditions. A combination of interchangeable cutter picks (drag bits) and roller cutter discs with replaceable wears protection. Manually extended (10–20-30 mm) over cutters. All cutting tools are designed capable to be replaced from the rear face of the cutter head. To maintain the ground face control with the EPB machine, the excavation is started by rotating the cutter head and adjusting the floor door openings to a pre-selected width. As the machine thrust cylinders extend, the ground at the front of the EPB and inside the cutting head is pressurized. The earth pressure cells within the cutting head measure this pressure. Once the pressure exceeds limit preset, the hydraulically controlled Pressure Relieving Gates are forced open allowing material to pass thought these gates and onto the primary conveyor. Man lock : An air lock conforming to CEN prEN12110 includes a 2-compartment, 4 man main compartment with 3 bar working pressure. Shield articulation cylinders : The front shield connected with articulation jacks operated with 250 bars, which makes possible to orient the back shield in relation to the front shield in all spatial direction. Main bearing : The main bearing is designed to transmit the cutter head torque and thrust forces. It has a rating of 10,000 hours L10 life and to take in account that the EPB is drive curves with a minimum radius of 250m. The outer and inner main bearing sealing systems is capable of protecting the bearing for 10,000 hours. A bulkhead designed to act as a pressure vessel end, to withstand the hydrostatic soil pressure of 3 bars, plus any adequate safety margin. Conditioning agents : When the soil can be conditioned to achieve the necessary plastic fluidity it is possible to balance and control the excavation volume against the advance of the shield. The conditioning agents are added through the bulkhead to the excavated ground so that conditioning can begin immediately and ensure that all material in the cutter head chamber has been transformed into the correct consistency. To lubricate the flow of material through the cutter head compartment and the screw conveyor. To improve the permeability of the material in very wet ground condition to prevent the passage of water out through the discharge gate of the screw conveyor. To improve the consistency of the material for easier handling of the muck from the discharge gate to final disposal. The foam conditioning material is a compressible air bubble, encapsulated in a detergent-like (92-94%) fluid, which added to the excavated material and keep the particles of the soil apart by reducing the internal friction and permeability of the soil. Shove, Pushing rams : The Pushing jacks are spaced around the back shield grouped to one shoe, permit articulation and square contact with the segmental tunnel lining. With reference to the sectioning of the segment lining – 7 standards segments & 1 key segment the number of jacks necessary are 28, coupled two by two. The 28 thrust rams have to work 5 to 7 groups separately. Advance of the machine (low speed and high pressure) during recycle sequence. Segment tunnel lining erection (high speed and low pressure). The nominal working pressure in the hydraulic system is limited with 350 bars. Tail skin : Provision for constant continuous pressure grouting the annulus of the tunnel lining with cementation grout through ports in the tail skin. 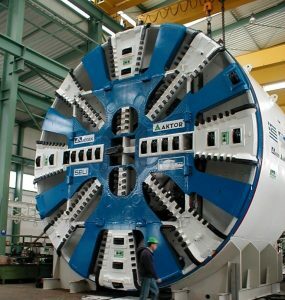 The grouting behind the segments will be executed simultaneously during boring operation. A tail seal with grouting system with a 2-row of bolted wire brush seals rated to withstand a hydrostatic pressure of 3 bars and to preventing leakage of ground water or grout. The lifetime of the bolted wire brushes is for 1 Km tunnel. One-row spring steel plates (270 degrees) is provided and installed to the upper side of rear shield periphery from the position time 700 clock up to 4oo clock and another row between the front and back shield articulation area. Screw conveyor : The screw conveyor is installed through the sealed Bulkhead into the cutter head chamber and removes the excavated material during the EPB advance. When the cutter head rotates, the propulsion system is engaged, and the screw conveyor starts. The speed of rotation of the screw conveyor anger determines the rate of excavation while maintaining control of the excavated face. The excavated material, which removed via an Archimedean screw conveyor, from the cutter head-mixing chamber at high pressure, discharged at the other end of the screw at atmospheric pressure, onto the first belt conveyor. This is done by controlling the rate of discharge via the discharge throttle at the upper end of the screw conveyor. Belt conveyor system : The belt conveyor system removes 650m3/h of excavated spoil from the screw conveyor in closed or open mode working condition. Segment Erector : The segmental tunnel ring is erected after the EPB advance by 1.5m with in the tail of the rear shield. The erector is used for the placement of the pre-cast reinforced concrete segments equipped with a single pick up head of semi-rotary type. In case of total loose of power supply (Breakdown) the vacuum system is capable to maintained (faultless seals) the segmental holding force for 30 min. The erector provided with a clockwise and anti clockwise rotational movement of +/- 200 degrees spaced equally above the invert of the tunnel. The erector has a pendant and remote control, to provide clear visibility of all erector movements. The six degrees of freedom are describes here below, which the erector designed, activated by hydraulic jacks with telescope arms and operated separately or simultaneously. Rotation around longitudinal axis of the TBM (in both direction clock and antic lock wise). Adjustment around radial axis (pitching). Rotation movement around radial axis. The erector system is designed for the installation of one ring within a period of 30 min. There are two types of conical reinforced concrete rings Left and Right which allow the Tunnel lining rings to turn towards left or right, up wards and down wards. Each type of ring (weight 40.6 tones) consists of 8 PCs segments, 5 regular segments, 2-counter segments and one key segment. The erection of the segments starts at the bottom and alternately, left / right, the ring is built up to the key segment using the segment erector arm. The key segment is inserted in parallel with the Tunnel axis at the end of the ring in place. The conical shape of the left and right rings are designed to have the key segment position between the upper side 9 to 3 o’ clock. The elastomeric compression rubber gasket glued to the mating faces of each segment, is being compressed between segments and rings of the Tunnel Lining and guarantees the water tightness of the Tunnel. The segments are bolted together with a high strength steel bolts Φ25mm, 500mm long with plastic sockets placed under the bolt washer (80*27*8mm) on each side of the joints. A concrete segment invert is placed after the ring erection to complete the Tunnel Lining. Above the invert segments track rails are placed, type 38 kg/m for sliding the TBM back up Gantries and the rolling stock. The invert segment left as permanent invert is grouted in placed by the two grouting pumps located at back up of the TBM. Grouting system : The grouting activities, behind the segments are executed simultaneously during boring operation. The grout is filling the annular void by three positive displacement single piston pumps “ Schwing KSP, 12-2D”. The grout flows easily, while being pumped with pump pressure of 2 bars. The grouting equipment powered by an electro-hydraulic power pack. The grout is mixed at the site surface batch plant, transported into the TBM by the main track trains, in mortar agitator tanks and is stored on the frame behind the grouting pumps at the back up of TBM. Control room : An air-conditioned control cabin is positioned at the gantry one of the back up system, at a distance of 22m from the excavated face. The control cabin contains all remote controls and indications for the safe operation of the EPB and its environment. The operation control cabin has space for a minimum of 4 persons. The control monitor and record the operational parameters of the TBM and its systems. The tunnel lining build area. The transfer of soil from screw to the crusher and to the primary belt conveyor. TBM end of back-up system. The control room is equipped with computerized guidance system. The guidance system SLS-T, relating to the services of the EPB has been developed by VMT GmbH. The SLS-T provides all the important information, which is necessary to drive the EPB along the designed tunnel axis. The Maximum deviation of the actual tunnel axis from the design tunnel axis in horizontal and vertical axes is +/- 40mm. In case of important deviation noted by the Guidance system a compensation curve is defined which progressively bring the EPB machine on the theoretical cycles of boring strokes. Fully decked, closed bottom where required with a single-track system and, segment off loading. The back up system trailer will run on wheel on track rail. Cranes for the unloading and transfer of the tunnel lining segments from the delivery wagons to the segment supply magazine. Rail lifting and transfer facility, for installing the construction rail track and segment tunnel invert in the invert of the bridge area. The length of the bridge between the TBM shield and the first gantry is sufficient to place rails of 9 metres long and 4 pcs of tunnel invert segments. Soil conditioning systems and equipment. The Foam processing plant which consist of the following. Continuous grouting system. The filling of the annular gap behind the concrete ring. Tail sealer grease pumping system. 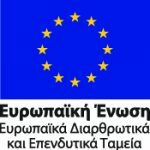 Provision for the extension of all surface connection services (Ventilation, Communication systems, De-watering pipes, Mains power supply, Compressed air Cooling water, Generator). Welfare and toilet facilities to include; toilets, washing, mess room. The ventilation system for the TBM, which consist of one-turbo ventilator. The passage volume is 816m3/min and the cross section of the ventilation tube 1* Φ800 mm. Dust content heavily dust laden atmosphere. Humidity up to 85% relative humidity. The machines are equipped with a flexible trailing cable (3*95mm) contained on a powered reeling drum capable of extending up to 250m behind the rear of the EPB back-up system and the total installed power was , App. 3,580 [kW].